Cooler Water Closer to the Dam! Flows have risen again to 190 cfs. Warmer water has the fish spread out into the deeper sections but cooler nights are now prevailing and this will bring things back to normal living conditions for the trout sooner than later. You’ll find cooler water the closer you get to the dam, and fishing in the deep sections can produce some nice fish. Take care when landing these fish after you play them for an extended period. The sooner you can land them the better. Try to minimize the trout’s “out of the water” time by having everything set up in advance for a photo if you choose to do so. A few seconds too long out of the water at these temps can be a death sentence to a trout. Crawdad patterns work great this time of year, along with #18 Copper Tiger Midges, #14-16 Parallel Perch, #14-16 Level Leeches, and Assassins dark and light both Parallel and normal. Crowley Lake: The Lake is Dropping at a Fast Pace! Owens River - Middle: Use Plenty of Weight to Get Those Flies Down! San Joaquin River - Middle Fork (Mammoth Lakes): Still Some Nice Wild Fish to be Had Here. Hot Creek: Some Rising Trout Through the Mornings. Walker River - East Fork (CA): Fish Spread Out into the Deeper Sections. 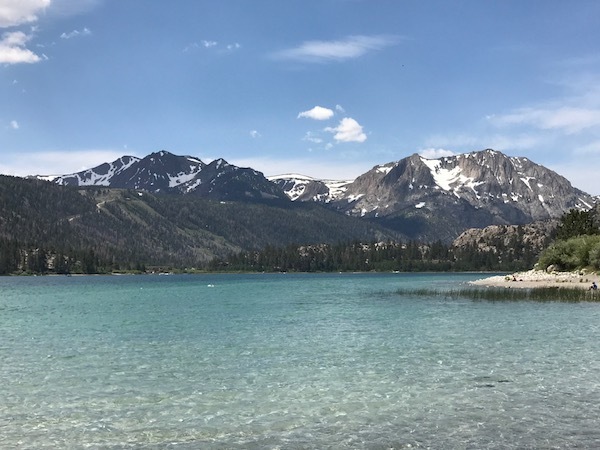 June Lake Loop: Grant/Silver Lakes/Alpine Lakes Fishing Report!